First things first for Airbus Safran Launchers ... "My first thanks go to the teams of Airbus Safran Launchers and Arianespace who ensured the necessary interventions to guarantee the safety and the performance of the Ariane 5 launcher, whose launch had to be postponed due to the work stoppage the Space Center Guyana,"so said Alain Charmeau, CEO of Airbus Safran Launchers. This second flight of the year took place less than ten days after the resumption of work at the Guiana Space Center with 5 more Ariane 5 launches planned in 2017. For its second launch of the year, Ariane 5 successfully completed its mission from the European space port of Kourou (French Guiana) for the 78th consecutive time, placing two telecommunications satellites in geostationary transfer orbit (GTO). "My first thanks go to the teams of Airbus Safran Launchers and Arianespace who ensured the necessary interventions to guarantee the safety and the performance of the Ariane 5 launcher, whose launch had to be postponed due to the work stoppage," said Alain Charmeau, CEO of Airbus Safran Launchers. "Together we will now take on a new challenge: five more launches in 7 months. With Ariane 5, we must renew our efforts to prove that our launcher is constantly adapting to be more efficient and competitive. I would also like to express our gratitude to the European Space Agency and CNES for their renewed confidence and support. " The launch performance achieved by this Ariane 5 ECA was 10,289 kg in GTO (of which around 9,415 kg was accounted for by the satellites). The launcher improvement program enabled an optimized GTO orbit to be used, with an inclination reduced to 4 degrees in order to minimize the energy the satellites need to reach their final orbit and satisfy fully Arianespace customers. 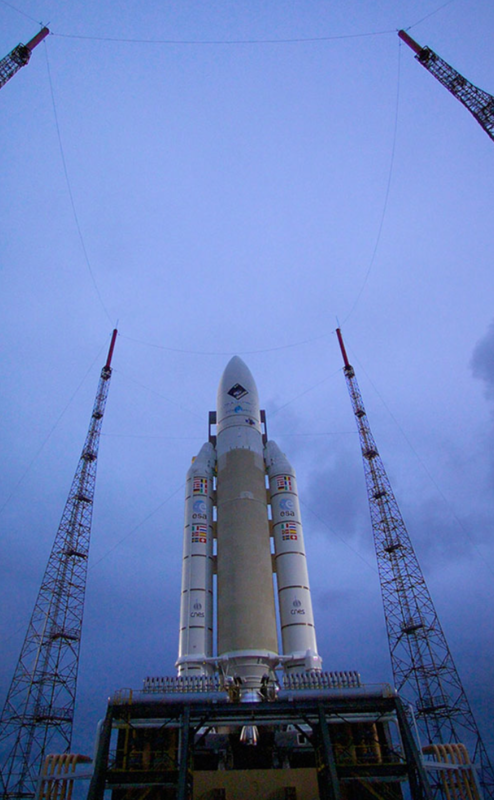 The lower satellite carried by this Ariane 5, under the SYLDA (Ariane dual launch system), was the heaviest ever placed on the LVA 3936 (Launch Vehicle Adaptor). This special adaptor was used to make up for the difference between the usual diameter of the launcher (3,936 mm) and that of the payloads (1,780 mm). Operational in the field of commercial launchers since 2015, Airbus Safran Launchers was definitively completed on 1 July 2016 and became a 74 percent majority shareholder of Arianespace on 31 December 2016. This new governance makes possible an overall approach to market needs from launcher design and construction up to commercialization, thus reinforcing industrial efficiency and operational flexibility for the benefit of Arianespace’s customers. Ariane 5 is the spearhead of European know-how and one of the most wide-ranging and ambitious space programs in the world. Its flexibility enables it to transport heavy payloads into low Earth orbit, several satellites into medium Earth orbit or, as it is the case today, one or two satellites into geostationary transfer orbit with an optimized lifetime. Airbus Safran Launchers is lead contractor for the Ariane 5 launchers. The company coordinates an industrial network of more than 550 companies in 12 European countries (including more than 100 Small and Medium Enterprises). Airbus Safran Launchers oversees the entire industrial chain, from management of launcher performance upgrades, to production management, to final adjustment with supply of the mission flight software and, from now on, its marketing through Arianespace. This chain includes equipment and structures, engines manufacturing, integration of the various stages and finally launcher integration in French Guiana. Airbus Safran Launchers is also industrial lead contractor for Europe’s future Ariane 6 launcher, which is scheduled for a first flight in 2020 and which will replace Ariane 5 in about 2023. 134th consecutive success by a launcher fitted with the HM7B engine.